Welcome to the website of The Official Houdini Séance®! This is the only true and genuine Official Houdini Séance®. The Séance was organized by escape artist/magician named Sid Radner, and had been for many decades until his death in 2011. Sid has trademarked the name Official Houdini Séance® and as Houdini would say “don’t be fooled by fakirs” (sic). 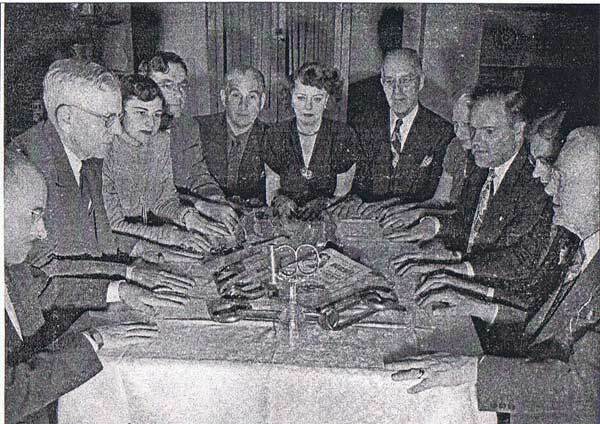 Sid Radner (third from right) and Helen Radner (third from left) with Walter Gibson (second from left) at Gibson’s NY apartment for the 1948 Official Houdini Seance.